What is your favorite film? It's a common question discussed amongst cinephiles the world over, and one artist has taken it even further. German artist Jan-Hendrik Pelz has debuted a gallery at the Locarno Film Festival in Switzerland this week titled "Favorites", featuring over 30 oil paintings of one frame of a film. Here's the concept - Pelz asked his favorite artists/filmmakers to name their favorite movie "together with a random number of maximum 5 digits as a time stamp. Stopping the movies later at the corresponding times created unpredictable freeze frames, which in the next step Pelz transferred into oil paintings." This mesmerizing gallery is the result of a year of work producing these paintings - see the various frames below. 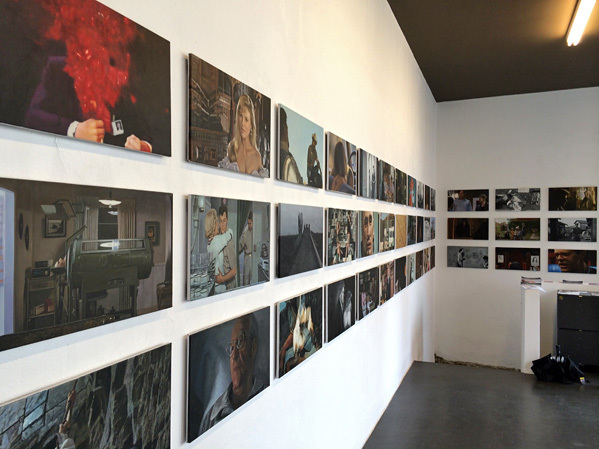 I'm currently in Locarno for the festival and stopped by the gallery to take a look. I was impressed, there's something striking about seeing random frames from such great films. Favorites span from Apocalypto to Zabriskie Point, with essentials like Taxi Driver, Magnolia, Apocalypse Now, Harold & Maude, Life of Brian, Andrei Rublev, Thelma & Louise, Goodfellas, North by Northwest, Batman, No Country for Old Man, Labyrinth, The Big Lebowski, Scanners and The Jungle Book. Artists he asked include Jonathan Meese, Luc Tuymans, John Baldessari, Pipilotti Rist, Hermann Nitsch and others. 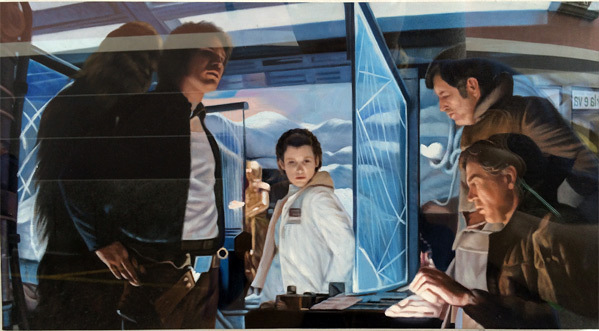 Finally, last but not least, it's the Empire Strikes Back painting (from 18:04) as selected by Charlie Stein. While browsing the gallery, I met and spoke with Jan-Hendrik Pelz (his official website) about the project, who told me that it took him a year to complete. Most of the selections are genuine favorite films, with some oddball picks thrown in (like Apocalypto, Sharknado, Mission to Mars, Hausu). For those wondering, the Scanners head explosion shot might not be random, as he told me that the artist who chose that one (Peter Kogler) needed an "extra day" to think about his selection before choosing Scanners and that time (12:29), which seemed a bit too coincidental even for him. But other artists chose numbers such as their birth year, or something else unique (12:34, or 1,2,3,4, from No Country - which still produced an interesting frame). It's easy to look at these and say, well, random frames chosen from favorite films don't produce the prettiest pictures, but I would disagree. 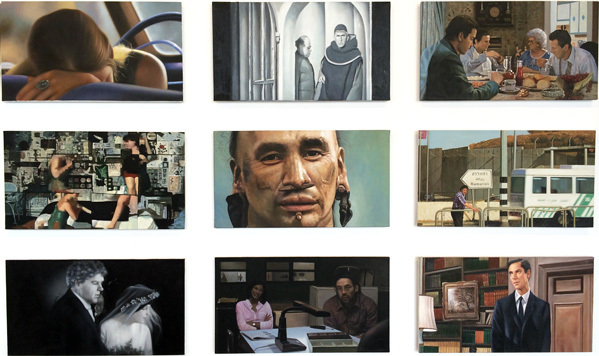 The lasting impression of this exhibition is that random selection can result in beauty, and that it doesn't always have to be the perfect shot to find something unique. Just look at the frame for The Big Lebowski. 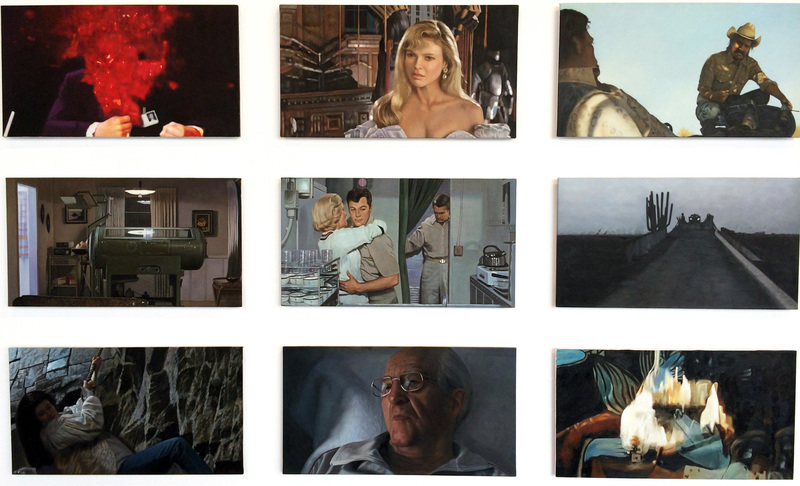 The power of this art is in the collection of all of them, and how mesmerizing it is to take one glance at a wall of nicely painted art that evokes so many emotions, feelings, questions, and thoughts about cinema. Hopefully Pelz's art will be touring the world over for many others to see in person. 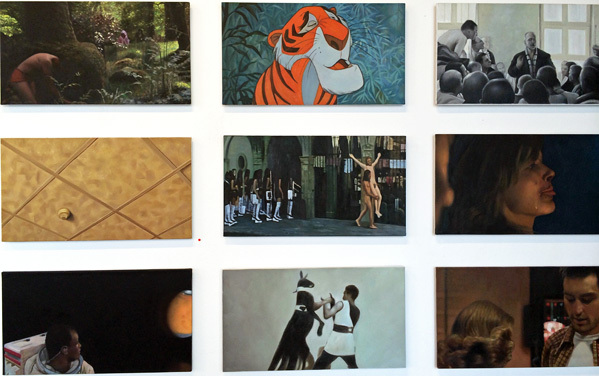 For more info on Jan-Hendrik Pelz's "Favorites" visit his website which includes the full list of names/films. How lovely. Dig the SCANNERS one.